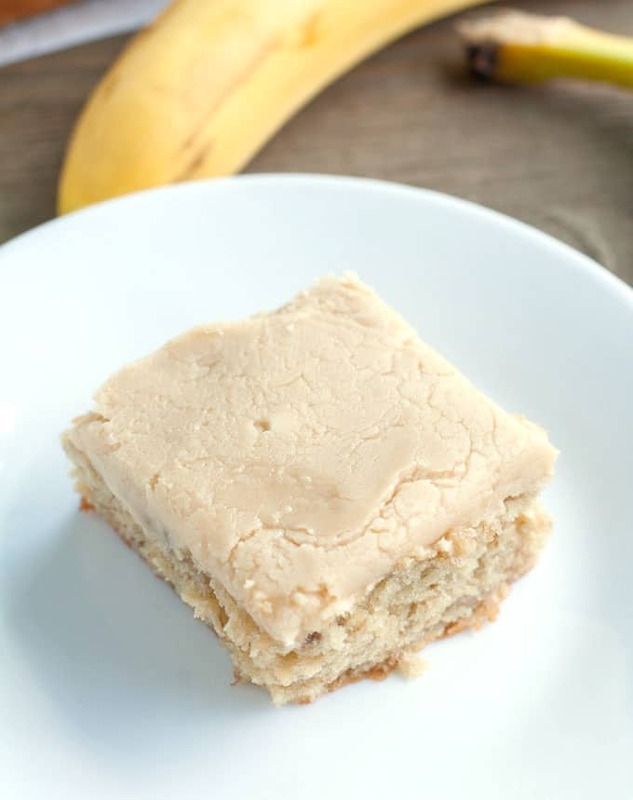 Banana Snack Cake is a delicious banana cake topped with a fudge like brown sugar frosting. We love bananas in our house. Typically they don’t last more than a few days because the kids eat them so fast. Occasionally I get lucky and have a few that stick around and get nice and ripe. This is the perfect time to use them for baking! 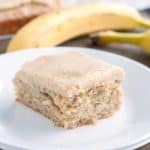 Recently I decided to make a banana snack cake with my ripe bananas. 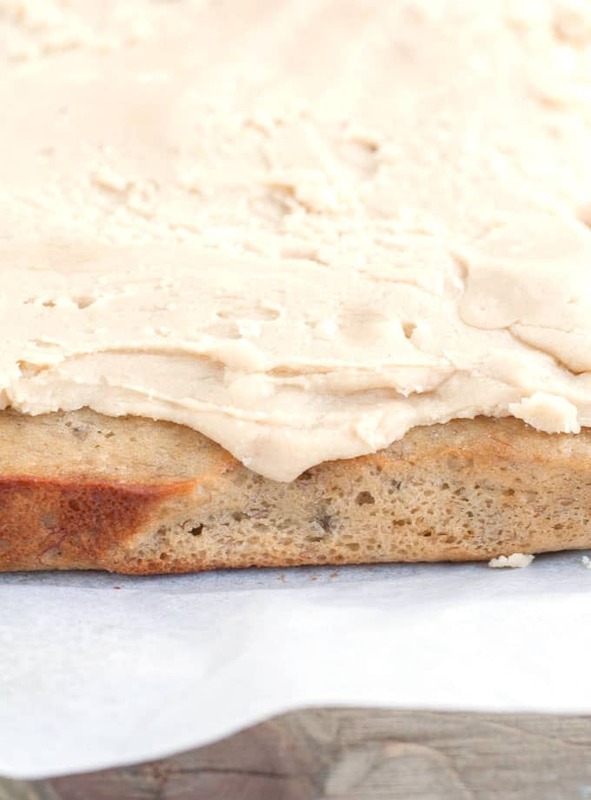 The cake has a similar taste to banana bread and is topped with a decadent fudge like brown sugar frosting. It is sooo good. 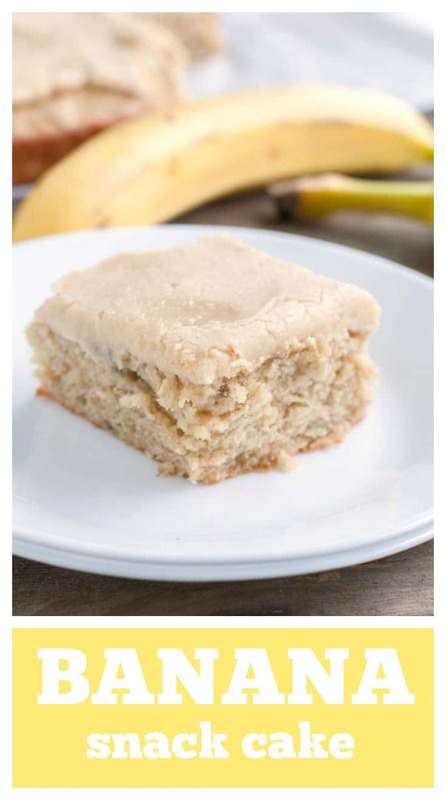 To make this banana cake, start by creaming together butter brown sugar and sugar. Add in some eggs, vanilla and of course nice ripe, mashed bananas. I used 3 bananas but 2 is fine also. Mix in dry ingredients of flour, baking soda and salt. Next add in sour cream and mix everything until combined. Pour the batter into a greased baking pan and bake for 25-30 minutes. Make sure when you stick a toothpick in the center of the cake, it comes out clean to ensure that it is baked. For the frosting, add butter, brown sugar and milk to a medium saucepan. Bring the ingredients to a boil over medium heat and cook for 2 minutes, constantly stirring. Remove from heat and stir in powdered sugar. Once combined, spread over cake. I hope you and your family enjoy this cake as much as we do! With an electric mixer, cream together butter, brown sugar and sugar. Add eggs, beating well. Mix in bananas, and vanila. In a small bowl add flour, baking soda and salt. Add 1/2 of the dry mixture to butter mixture and then add sour cream. Pour in mix in remaining flour mixture. Pour batter into baking dish and bake for 25-30 minutes. Cool on a wire rack. For the frosting, place butter, brown sugar and milk in a medium saucepan. Bring to a boil and stir for 2 minutes. Remove from heat. Mix in powdered sugar until combined. Spread over cake. Hi. My daughter and I are trying out this recipe. However, in step 2, you say to add the eggs, beating well. Unfortunately, there aren’t any eggs listed in the ingredients, so we aren’t sure how many to use. So sorry about that! Just updated the recipe. Hope you and your daughter enjoy!